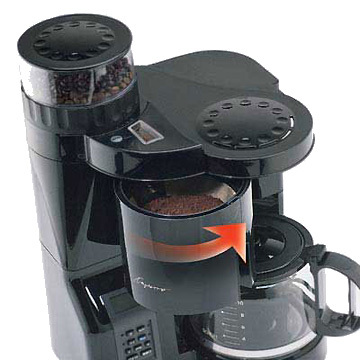 Best coffee maker grinder must provide consistent grind and maintain full aroma to deserve the "best" title. Because the grind to the brew is in-sync, an inconsistent grind would mean a not complete brew (under extraction). So, blade grinder coffee maker combo would never make it to my "best" list. The reason being the less consistent grind and also the high heat generated that lead to a loss of aroma with a blade grinder. Only a coffee maker that comes with burr grinder, is worth our time in investigating their capability. And in the market, there are not many burr and coffee maker combo. 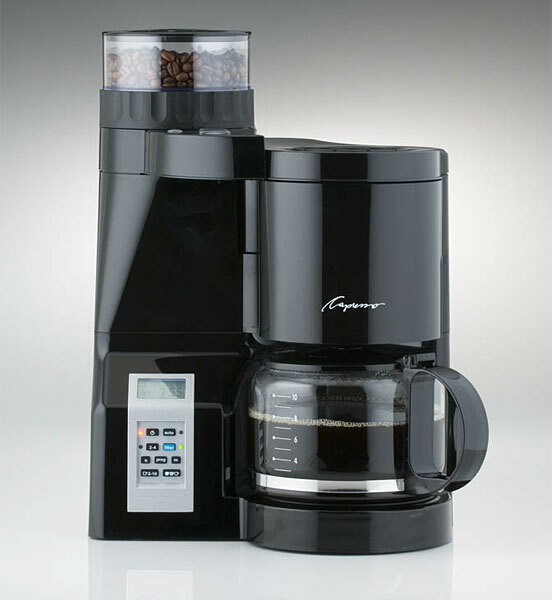 One that I believed fits the best coffee maker grinder status would be the Capresso 454 CoffeeTeam. Capresso is well known for its burr grinder and it also produces some very fine coffee maker. The 454 CoffeeTeam can be said to be the combination of the best. The Capresso 454 CoffeeTeam features a conical burr grinder, this gives a consistent ground. And the slower grind of burr ensures that heat generated is minimal. This helps to preserve the aroma of the coffee beans. Then, combining grind and brew is not an easy thing, with brewing generating high heat and steam. But, Capresso 454 CoffeeTeam construction has cleverly aligned the 2 in such a way that the grind to brew is possible, and the steam and heat of the brew would not affect the grinder. To deserve the "best" title really means going the extra mile. Normal coffee maker, allows programmable brew, Capresso 454 CoffeeTeam allows you to adjust the grind finess, the strength of the brew and the number of cups at the time you want to start the day. Capresso 454 CoffeeTeam Comes with programmable grind and brew, conical burr grinder that does 4 different grind sizes, multiple brew selection and a look and feel for any modern kitchen design. If she is not a best coffee maker grinder combo, then it is very difficult to find one that is!